Newsgroups can help you stay in touch with other online investors. Unlike stock message boards, which run on Web sites, most newsgroups live on a pretty ancient network, called Usenet. Usenet is a corridor of the Internet that’s roped off for discussion groups. Usenet hosts newsgroups that pertain to just about any topic you can imagine, and some you can’t. You can find forums where members talk about grooming their pets, tuning their cars, and, oh yeah, investing online. Because you can find thousands of forums on Usenet, they’re all carefully categorized by topic. Usenet uses a very precise naming convention so that you can zero in on a topic quickly and find the appropriate forums. Usenet forums are given a three-part address, much like a street address. First, there’s the broad category, or section, which is equivalent to the state on your home address. Beneath these main sections are the secondary sections. Using my address metaphor, the secondary section is like your city. Lastly, the groups are broken into very specific topic areas, much like your street address. A typical newsgroup address would look like this: section.second section.topic. For instance, a newsgroup dedicated to mutual funds is misc.invest.mutual-funds, where misc is the section, invest is the secondary section, and mutual-funds is the topic. In case you haven’t noticed yet, the whole newsgroup address naming convention is a bit of a hassle. That’s why you’ll probably access newsgroups using Google Groups, as I describe in the following section. Google Groups handles the whole Usenet address nightmare for you. So, you understand how Usenet addresses work and the kinds of topics that are available. But how do you access these newsgroups? Because Usenet newsgroups are essentially in the public domain, you can access them in many ways, but Google Groups is the easiest way. Google Groups lets you search all available newsgroups by entering the group name or topic in the search field without installing any special reader software. Try terms like investing, investing online, and money. You don’t need to remember or look up the complicated Usenet addresses. 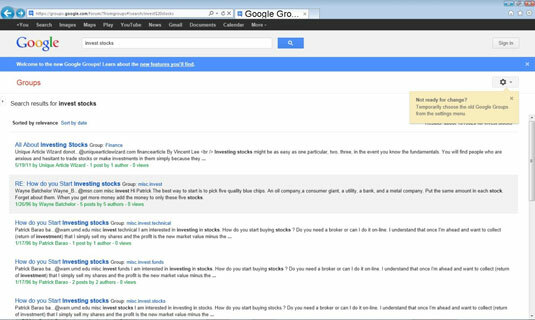 Google Groups also organizes newsgroups by topic area. Just sign up for the service or log on using your Google Gmail account information, although some newsgroups may require additional registration. Although newsgroups can be okay sources of investment chatter, social investing sites are typically better bets because they make their users more accountable. Newsgroups are also often overrun by marketing companies that use the groups to pitch everything from diet pills to discounted travel.